Your school website is the window into your school that anyone can look through whether it’s potential parents, current parents, Ofsted or the wider community. Having a beautifully presented website is therefore vital. However it also means having the correct school website requirements. Statutory Information refers to the information required by the DfE to be accessible on a school website. A big issue for schools is around the area of compliance and we are always on hand to offer advice and support around this area. 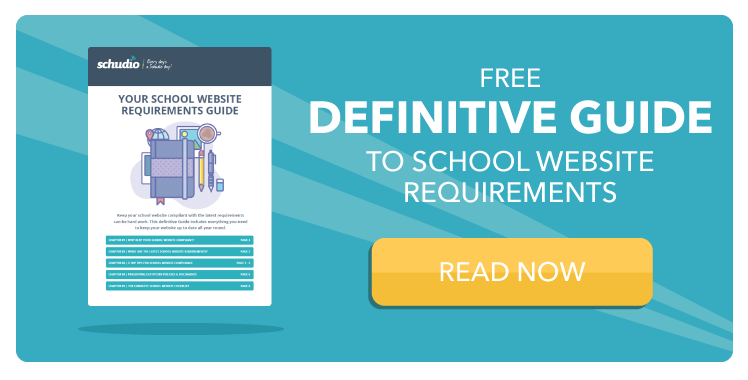 What requirements do you need on your website? In this blog post we’re going to be looking at the equality objectives information on school website. This should be readily accessible and easily found on your website. Details of these publishing obligations are set out in Equality Act 2010: advice for schools. The Act also specifies particular areas of protection e.g. in employment and within education and set out general and specific duties which schools must meet. The public sector Equality Duty consists of a general duty but also specific duties that are designed to help organisations meet their general duty. A recent update in the Governance Handbook (March 2019) has identified that if you are part of a Trust or an Academy, you will need to ensure you include how you comply with the gender pay gap in your organisation. It states: Under the Equality Act 2010 (Specific Duties and Public Authorities) Regulations 2017 organisations are required to publish information on its website about the gender pay gap in their organisation. If this applies to your setting, it would be advisable to update your policy now to show best practice. Publish specific and measurable objectives. Your equality objectives should be based on your analysis of data and other evidence. As a result they should focus on those areas where you have agreed to take action to improve equality and tackle disadvantages. Furthermore they should be regularly reviewed alongside the progress you are making to meet your equality objectives. Here are three examples of objective statements that aim to address equality priorities, but would not meet the requirement to be “specific and measurable”. Increase the percentage of boys in key stage 2 achieving age related expectation in mathematics. To train staff on how to respond to an incident relating to Prevent. Narrow the gap in attainment between disadvantaged and non-disadvantaged pupils. By the end of the school year 2018/19, the percentage of boys in key stage 2 achieving age related expectation in mathematics will increase from 70% to 75% and to 80% by the end of the year 2019/20. By July 2019 95% of staff will feel confident in responding effectively to an incident relating to Prevent as shown by the end of year staff survey. The attainment between disadvantaged pupils and non will improve year on year to meet a target of 80% by the end of 2020/21. To evidence the three General Duty areas detailed above, you could publish and/or reference a range of information ranging from other policies (eg bullying, exclusions etc) to performance information on the achievement and attainment levels of pupils. You should structure part of your policy statement around these principles and outline how they would be evidence in your school. Ordinarily it is not advisable to take a text dump of the legislation and place it in a policy document. So put it in the context of your school. DfE advice for school leaders and governing bodies states that a school “should set as many objectives as it believes are appropriate to its size and circumstances; the objectives should fit the school’s needs and be achievable”. It is up to you as a school to decide on the format you will adopt for publishing equality information and objectives. So then for most schools, setting up an equalities page on your website will be the best approach. Why you have choses specific objectives, including any relevant consultation and engagement. It’s time to review your equality objectives information on your school website. Use our School Website Requirements Guide to help you with this. It might be worthwhile to check any policy documents relating to the equality objectives. Also you can download a checklist here that we've created for you to use as a starting point to check the status of the equality at your school.